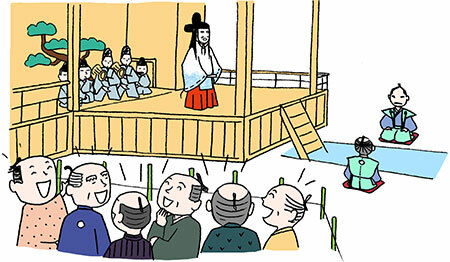 TRIVIA of Noh : Q149 : Was there a Noh stage in Edo Castle? | Home | Trivia | Q149 : Was there a Noh stage in Edo Castle? Was there a Noh stage in Edo Castle? In the Edo period, Noh plays were performed during important ceremonies for the shogunate, so the art gained the status of ceremonial performance and was increasingly considered an essential part of samurai culture. Noh actors were given allowances by national or local governments, theatres were built in castles and samurai residences across the country, and plays were performed at ceremonies for special seasonal occasions. As the main setting for ceremonial performances, Edo Castle was equipped with several Noh stages, where Noh plays were presented on a variety of occasions, including New Year first chanting ceremonies. The central facility of the castle, Honmaru Goten (the palace in the castle keep), was located in present-day Kokyo Higashi Gyoen (East Garden of the Imperial Palace), which is now open to the public. Honmaru Goten consisted of three layers: “Omote” (the government office), where ceremonies and audiences were held, “Ōoku” (the inner palace), where lawful wives and concubines lived together, and “Nakaoku” (the official residence, at the center), where the shoguns lived and worked. A Noh stage, known as “Omote Noh Butai” (the main Noh stage), stood in front of the great hall, which was the most prominent position in Omote. On the main Noh stage, plays known as “machiiri-noh” were performed on special happy occasions such as births of heirs. Even common people not normally allowed to enter the castle were allowed to watch machiiri-noh and given lavish presents, including sake and sweets. We can see common people in a gleeful mood in woodblock prints depicting machiiri-noh at this time.